Lisa Kivirist and John Ivanko are innkeepers of the award-winning Inn Serendipity Bed & Breakfast, completely powered by renewable energy. 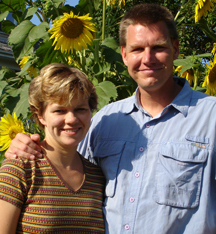 This husband-and-wife duo are national speakers, marketing consultants and co-authors of ECOpreneuring, Rural Renaissance and Edible Earth. They've contributed to projects for the National Sustainable Agriculture Coalition and the non-profit organization, Renewing the Countryside, providing success stories and practical resources for rural entrepreneurs and farmers. Kivirist is a Senior Fellow, Endowed Chair in Agricultural Systems at the Minnesota Institute for Sustainable Agriculture at the University of Minnesota, W.K. Kellogg Foundation Food and Society Fellow, and program director for the In Her Boots project of the Midwest Organic and Sustainable Education Service. Ivanko is a professional photographer, FAA-licensed drone pilot with FLYING COLORS Drone Cinematography+Photography, and the co-author, with Maya Ajmera, of numerous multicultural children's books, including the award-winning Be My Neighbor, To Be an Artist and To Be a Kid. Kivirist and Ivanko share their farm in Browntown, Wisconsin with their son, a 10.8 kW solar electric system, and millions of ladybugs. For more information about Inn Serendipity, visit www.innserendipity.com. John Ivanko (requires Adobe PDF Reader for viewing). Read more about what Kivirist and Ivanko are examining today on their blogs (featured on their Facebook pages). 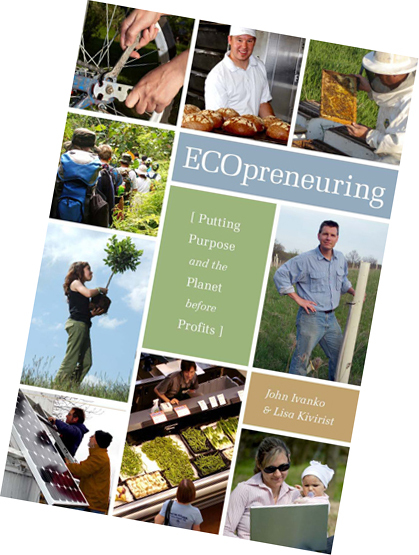 Order your copy of ECOpreneuring from Inn Serendipity (a PDF file order form). Copyright © JDI Enterprises, Inc. All rights reserved.